As mentioned in yesterday’s post, last night was quite warm, for the time of year; the overnight low hovered around 10 C (50 F). 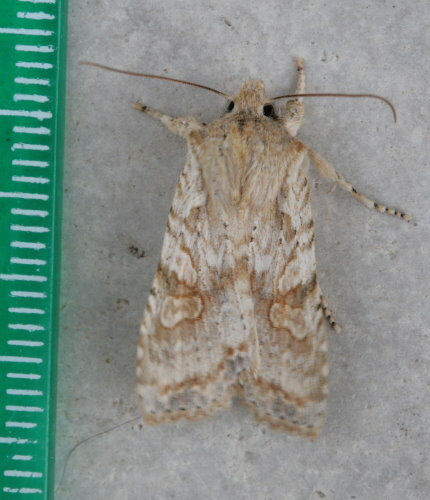 After a couple of weeks of near- or below-freezing temperatures, I was delighted to have the opportunity to put out my moth trap and catch some moths. When I went to bed I saw a few moths circling around the light, but mostly what I saw were Giant Water Bugs. I was excited to open up the trap this morning and see what had flown in while I was sleeping. There were seven or eight water bugs in the trap, which I had to carefully release without triggering a phobic freak-out (I can’t help it, there’s just something about them). Once they were out of the way, I could examine the rest of my catch. 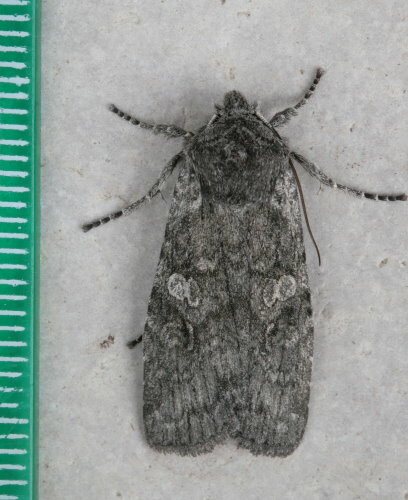 There ended up being about 14 species of macromoth (those that are on the second half of taxonomically-ordered species lists, generally larger species) and several micromoths (those in the first half of the list, mostly small). 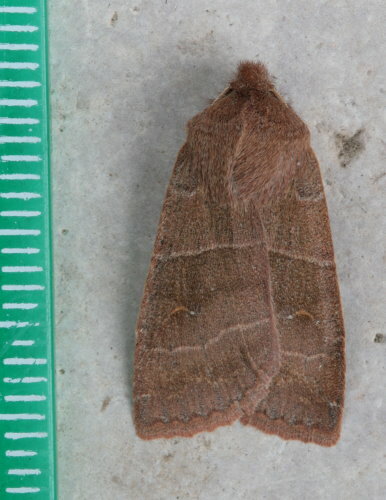 I would classify my skill level with moths as intermediate-newbie – that is, I could probably identify a third to half of the moths coming to my lights over the course of a year, and have a reasonable sense of taxonomic groups, but I’ve still got looooots left to learn. And that’s just for the macromoths. The micros, I haven’t even really touched them yet. I’ve already got my hands full. So the micros from last night, for the most part, went unidentified. Autumn isn’t the most colourful season, as far as moths go. There are lots of browns and tans and grays, colours that blend in with the muted leaves and bark that dominate at this time of year. Still, most of the moths that are on the wing in the cooler months are subtly beautiful in their own way, with intricate patterning and soft hues. The majority of the species I caught last night are probably ones that will overwinter as adults, tucked into a nook somewhere. A few may have laid eggs that will hatch out come spring, while the adults die with prolonged cold weather. In general, the pinions, sallows, and some of the darts are the fall/spring groups, with members from these three groups comprising the majority of a catch. 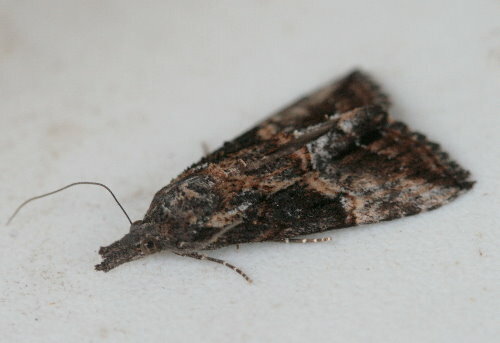 Eight of my macromoths last night belonged to one of these three groups. So many familiar faces: every one of the moths above were at my lights in the spring, too. They’ll head off for a long winter’s snooze, but I’ll see them again in five or six months. It’s kind of nice to have two opportunities a year to learn these species; others may only fly for a short span, some as few as two or three weeks in the middle of summer, and it can be hard to learn and remember some of these from one year to the next. New faces, too. This guy, and the next, below, and the one after that, they were all new to me last night. 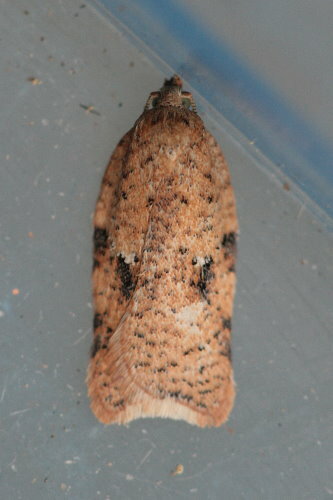 I find this an exciting aspect of mothing that one doesn’t really get with many other groups of organisms. Once I’ve learned the birds of my yard, the 150 species or so that I might expect to encounter in the area, that’s pretty much it; every bird you see is most likely going to be one of those 150. 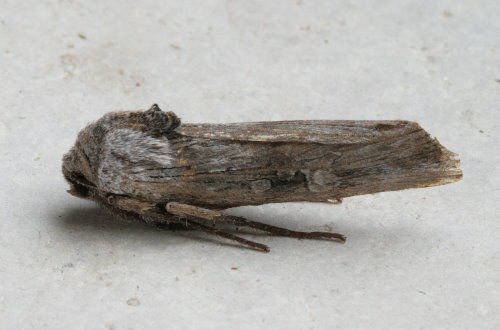 But moths, there’s so much less predictability in moths. 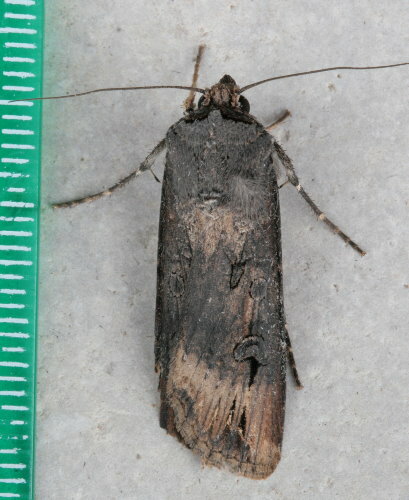 Even my friend and co-author Dave, a long-time moth’er, still gets species he’s never seen before, or maybe seen once or twice, turning up at locations that he’s been mothing for years and years. For me, part of the reason I’m getting so many new species is just that I’m still so new to the hobby, relatively speaking. 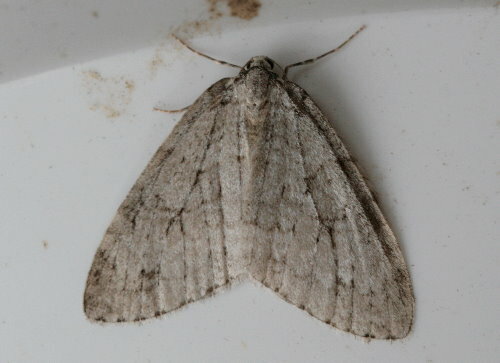 It may be possible to learn your birds in a year or two, if you apply yourself, but moths will take years. Part of it is that Dan and I have been moving around a bit the last couple years, and each new location, with new habitat, provides new species. 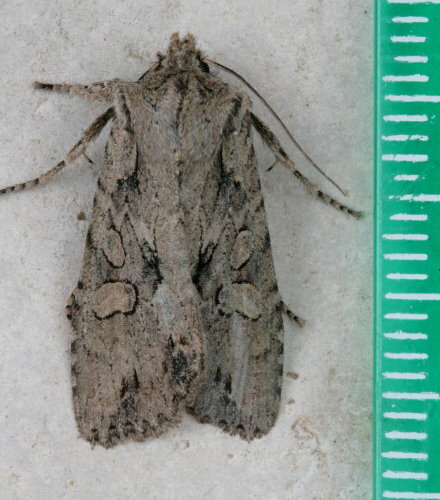 However, a large part of it is that there are more than 2000 species of moths in Ontario, many of them rare and/or local in occurrence. To see all of Ontario’s species will require time and patience, and perhaps a good bit of traveling to different regions and habitats. 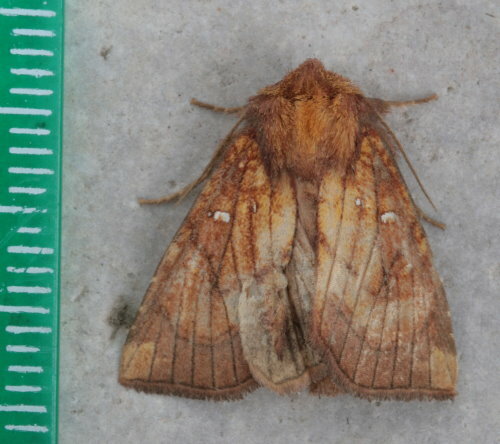 You’ll notice that most of the moths presented here have a green ruler alongside them. The marks on the ruler are millimeters, and give you a sense of scale. 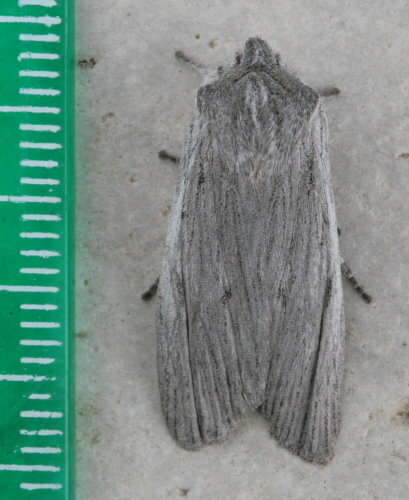 I didn’t used to include a ruler in my moth photos, but have been trying to make a point of doing so lately. The measurements will be used in the new field guide, and taking a photo is easier than writing it all down in a notepad, since I’m taking the photo anyway. Also, it allows Dave to confirm my ID, or to identify something for me if I don’t know it. 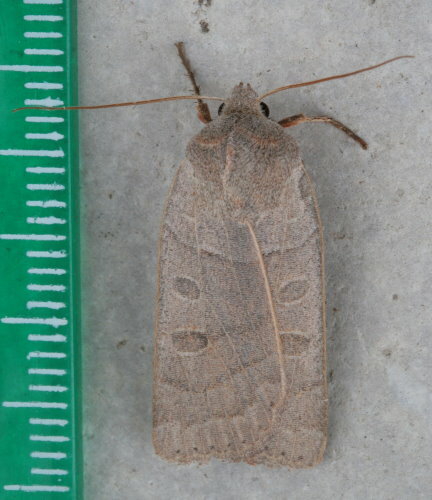 I still defer to him in that department – I can’t wait till there’s a better guide out for identifying moths! All the parts of the book that actually require being able to identify the moths I’ve left to him to tackle; it seemed best. The trap will get packed up and head back down to the basement again, now. If I’m lucky we might get another good night of moderately warm temperatures, but anything more this year I will consider a bonus; I’m expecting the season to be pretty much finished at this point. It’s so sad to put things to bed for the winter, but at the same time, it makes their return in the spring that much sweeter. 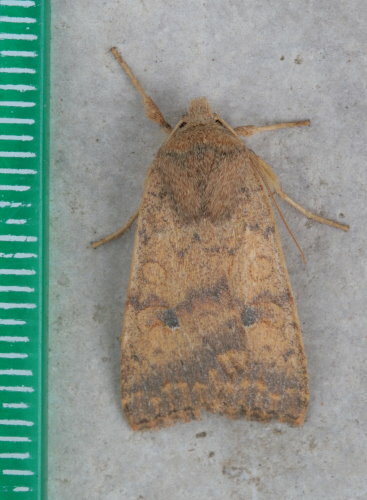 I’ll be much more excited to discover a Morrison’s Sallow circling my porch light in March than I was yesterday. And since I’ve now run out of things to say (I’m impressed I managed even 10 paragraphs of rambling), here are the rest of the moths from last night, sans ramble. 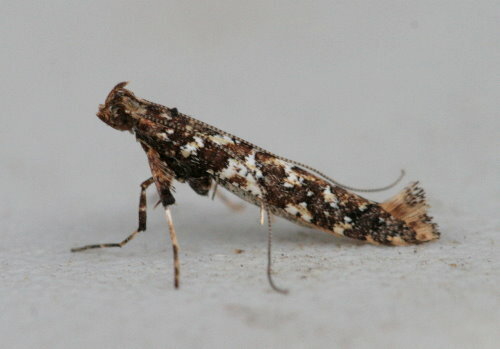 Caloptilia serotinella; no common name. This guy is less than a half inch long. Hi, I just wanted to ask a question about your forthcoming Moth Field Guide. Will the plates be photos of live specimens, or will they be pinned specimens? Everyone that I talk to is hoping for live specimen photos, since that is how we usually see them. 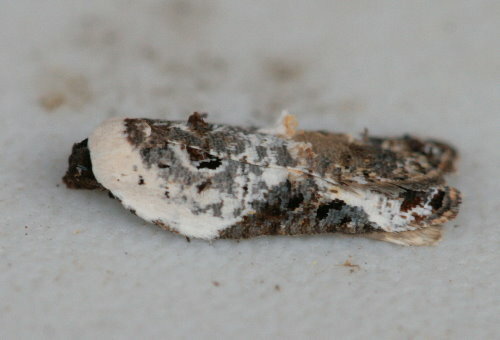 Whichever, I’m anxiously awaiting an updated Moth Field Guide! Hi Audrey – I’m glad to hear that there is so much demand for the new book! It is indeed going to be a live-specimen guide. The majority of the photos have been taken by Dave Beadle over the last few years of stuff that’s come to his lights. When the previous Peterson guide was done I suspect many if not most moth enthusiasts were collectors, rather than catch-and-release, so it was more appropriate to have pinned moths. It’s just a rough draft prepared by myself to get a visual idea of how it will look and make sure we were accounting for all the pieces; the publisher will be completing the final version. The design may end up changing a bit between now and then, but the general layout should be similar, and the content will be basically the same. Hi Audrey – I added a page about the new guide that has a few more details about the book. Yes, moths are about done for the year, Michelle, but I do hope you’ll check some of them out next spring! They’re a diverse and fascinating group.